(Shown above, this Fender Model FP-6 attachable pickup produced for their flat-top round-hole guitars, such as the Wildwood range. This pickup was designed to clamp onto the circular steel bar which runs within the guitar body, from the guitar’s heel to the end-pin (A0163). In 1965, the Fender Musical Instruments Corporation introduced a range of hollow-bodied electric guitars and basses. These instruments were fitted with pickups by Rowe Industries. The Coronado I guitar had one pickup, one volume control and one tone control. The Coronado II guitar had two pickups, two volume controls, two tone controls and one three-way switch. The Coronado XII twelve-string guitar had the same electronics as the Coronado II guitar. Two types of pickup were produced for the guitars – one in an all-chrome finish and another with a ‘Black Tee’ insert in the top of the pickup. All of the Coronado Basses were fitted with one type of pickup – very similar in appearance to the guitar pickup with a ‘Black Tee’ insert in the top. Both types of guitar pickup and Bass pickup were produced in two different heights for Bridge and Neck mounting. The neck version is 3/8″ (9 mm.) in height and the bridge version is 1/2” (13 mm.) for both guitar and bass. Each pickup is seated on a black, soft, plastic base. A set of Coronado Guitar pickups with black T-shaped inserts. This pickup’s adjustable poles are individual pin-shaped magnets, each with a bonded threaded sleeve which extends below the visible pickup into the guitar’s cavity below. A set of all-chrome Coronado Guitar pickups. These pickups’ poles are slotted setscrews. These pickups do not require a recess in the instrument. A set of Black Tee Coronado Bass pickups. Bridge and neck versions of Fender’s Coronado Bass pickups. Unlike the ‘Black Tee’ Guitar versions, these pickups did not extend into the bodywork as they are a variation on the basic bar pickup. The metal enclosure is the same size as for the guitar Black Tee inserts. Model FP-6 Attachable pickup, with outer V and T controls, was marketed separately by Fender, for their range of flat-top roundhole guitars fitted with a central supporting rod. Another attachable guitar pickup was produced for Fender. 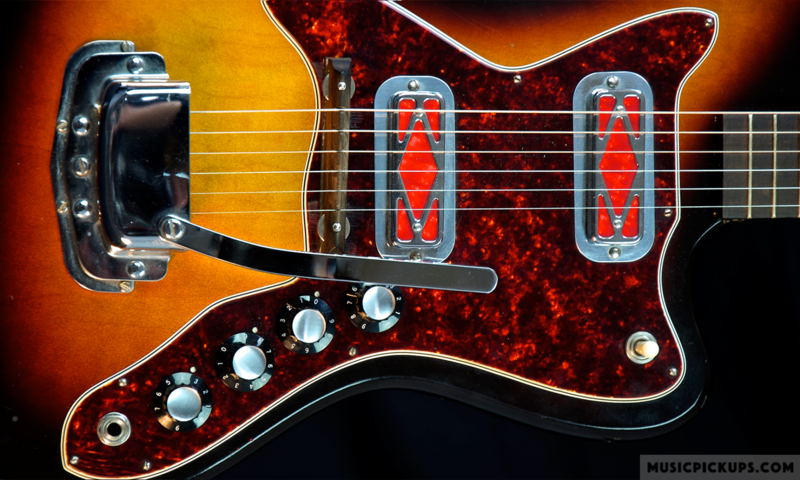 This model was similar to the FP-6 but with the pots’ edgewise knobs projecting through the chrome cover, similar to DeArmond’s RH series pickups. DeArmond usually sold pickups to musical instrument manufacturers as fully wired complete harnesses as shown here. These all-chrome pickups are, according to the packaging, for the Coronado II, ‘Old Style’. This implies that the Black Tee version as shown in the top two photos above, are the ‘New Style’. The date stamps on individual instruments show there was an overlap period in the supply of both types of pickup. 1967 Fender Coronado I Bass. 1967/1968 Fender Coronado Wildwood IV guitar, with Black Tee pickups. B0486A – 1967/1968 Fender Coronado Wildwood IV guitar, with Black Tee pickups. All metalwork, including pickups, finished in gold. B0256 – 1966 Fender Coronado 1 Guitar in Lake Placid Blue finish. B0326 1966 Fender Coronado II guitar in Sunburst finish. B0164 Fender Coronado XII 12-string guitar with the distinctive Hockey Stick headstock.